This evening it unexpectedly cleared. I photographed the only available pass of Lacrosse 3 (97-064A) to clearify whether it was still on-time. It was: I obtained two points with delta t resp. 0.03 and -0.08s and delta positions 0.019 and 0.039 degree respectively. The pass was a very low pass however, the satellite did not come higher than 25 degrees in the sky. This made it difficult, and I only managed to capture it on two images when the satellite was just above rooftop level, in a "gap" between two roofs. 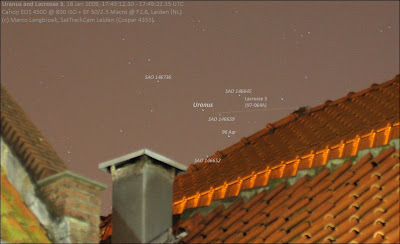 On the first image it appears from behind the roof (endpoint measurable), on the second it disappears behind the roof (startpoint measurable). When astrometrically measuring the images, I noted a relatively bright star near the end of the trail that I could not identify. It was also on the 2nd image. The star was bright enough that it should appear in the database AstroRecord uses, and my Sky Atlas didn't show a star there either. So...? By that time, I was thinking: Oi, what's this?!? A nova?!? h m s h m s ° ' "
I don't mean to be dull about such things but why point your telescope at the roof? You should be up there doing your work.